Surgical clips and staplers are predominantly used for securing medium and large caliber vessels during laparoscopic surgery. Surgical clips may be either titanium (Fig. 7) or polymer-plastic and are available in various sizes. Titanium clips can be applied through manual loading (reusable applicator) or automatic self-loading (disposable) applicators. The titanium clips may fall off during subsequent dissection and manipulation and hence multiple clips should be applied, especially during ligation of larger caliber blood vessels. The clips should be evenly spaced and should not cross each other in order to be effective. It is also important to leave a sufficient vessel stump after the last clip to ensure safety of the clip ligature. The locking plastic clips have significantly improved the security of surgical clips (Fig. 8). These clips are applied such that the entire clip encircles the vessel and once fired, locks into place. The clips are available in 5, 10, and 16 mm sizes. The 5 mm clip also has a disposable, automatically reloading applicator. These clips are generally more reliable than titanium clips and are currently our preferred method of securing medium to large vessels such as the renal artery and venous tributaries. Although various reports have supported the use of such clips on the main renal vein, we currently reserve tissue staplers for that purpose. The availability of the 16 mm Hem-O-Lok™ d clip may lead to the routine use of the Hem-O-Lok technology for renal vein control. 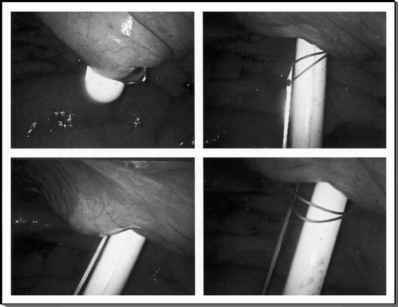 Endoscopic stapling devices are generally employed for securing hemostasis for large vascular structures such as the renal vein and rapid division of tissues. Typical endoscopic staplers are of a linear GIA type and lay six staggered rows of staples and cut between rows 3 and 4. The latest generation of endoscopic stapling devices can both articulate and reticulate allowing an increased range of angles for soft tissue and vascular stapling. The stapling cartridges are available in various lengths (30, 45, and 60 mm) and various staple heights (2, 2.5, and 3 mm). The 2 mm stapling loads are typically used for dWeck Closure System, Research Triangle Park, NC. FIGURE 9 ■ Ethicon needle driver. FIGURE 10 ■ A suction-irrigation system. hemostatic vascular stapling. The 3.5 mm loads are typically used for soft tissue stapling wherein vascularity of the stapled edges needs to be preserved (e.g., bowel anastomosis). Certain precautions need to be taken to ensure safety of endoscopic staplers. First, the correct load of staples must be used as per the type and thickness of tissue to be stapled. Second, care must be taken not to fire staplers over clips. However, staples can be safely fired over previous staple lines.